The little space for free expression in the Communist country continues to shrink, with at least 15 activists and dissidents having been arrested this year alone. Just recently, a Vietnamese court jailed a blogger for seven years for propagating anti-state propaganda which included articles that supported protests against a Taiwanese company that was responsible for a toxic spill last year. The accusation fell upon Nguyen Van Hoa, an environmental activist, that he instigated protests against the authorities via his Facebook account following the infamous 2016 toxic spill from a steel factory operated by Taiwan’s Formosa in the province of Ha Tinh. The repercussion of the toxic spill was vast, causing thousands of fish to be poisoned along a 120-mile stretch of coastline which subsequently decimated the incomes of fishing communities in the area. Protests against the Taiwanese company were met with crackdowns by authorities. “This, in a country where such large mass actions are prohibited. The issue was a popular converging point for many actors, not just for the community, but also the nascent civil society, the democracy movement and the general public. It has the potential to snowball into something larger. So, the recent wave of arrests in Vietnam of bloggers and activists is in a way connected to the Formosa issue,” he added. The conviction of Hoa comes more than one month after authorities detained Tran Thi Xuan, another Vietnamese activist demonstrating against Formosa. Xuan was charged under a separate part of the criminal code that carries a possible death sentence for attempting to overthrow the government. 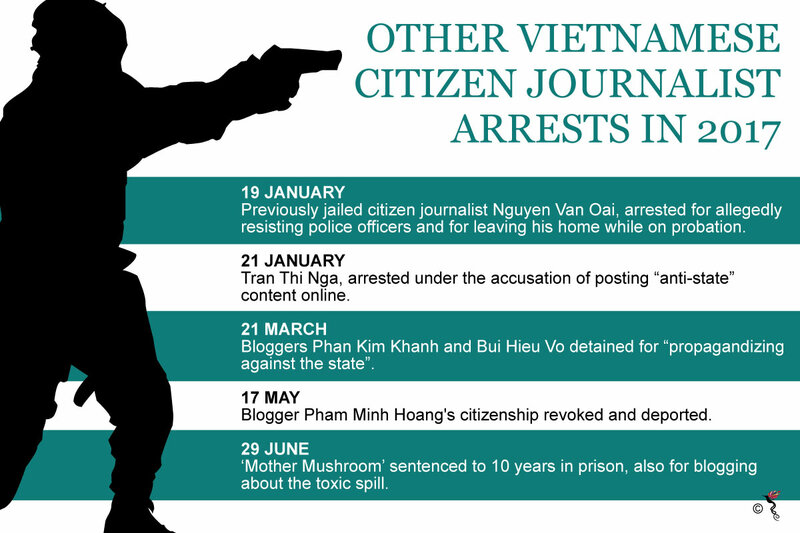 Examples of other Vietnamese citizen journalist arrests in 2017. Vietnam routinely imprisons activists, bloggers and lawyers, but its poor rights record worsened further after a new conservative leadership assumed power last year. “Though regrettable, I consider the arrest as a normal course of action by Vietnamese authorities, in the context of the severe existing restrictions on freedom of expression and press freedom,” stated Edgardo. In countries like this, the challenge remains for citizen journalists and bloggers such as Hoa. Unfortunately, they are recognised by the world journalist community but not in their own country. Reporting on such an issue in Vietnam, where rules are particularly strict and actively enforced - is where the danger lies for bloggers - because it touches on the issues of justice, reparations, and governance which are all ultimately political. “That said, there is always some room for improving professionalism and ethics in reporting, which will help broaden space for civic discussion on such issues. The challenge for independent journalists is how to report in such a way that gives legitimacy for their work, and not get arrested or be accused of undermining the state. Independent (or any) journalism must be conducted with such high standards so that the tolerance of authorities for discussion on sensitive issues will slowly expand,” explained Edgardo.